When I register at this coinminerz, I fill confuse and dizzy. I don't know what to do. Some bugs still on the site. After any action, we need to refresh to see what happened. Such as when you click and buy wood, the balance still display the previous balance. It will be like that until we refresh or click another tab / button. So, how we play coinminerz ? Use your initial satoshi to buy wood and stone. Please be aware in this stage because you need to build all type of building available. So don't try to upgrade unless you're very sure your balance is enough to build gold and coin smelter. Now, your coal and gold mine worker start digging, move the production to store house. Also don't forget to transfer your "Power" in the "Power Wheel" to your store house. After that, you can start go to production tab and start producing gold. After your gold production finish, collect them and send to coin smelter. Your coin can be trade into wood and stone that needed to upgrade your building. If you're good in math you can try to adjust when you need to upgrade for each building so you can earn faster, your strategies will be counted. You can withdraw when your balance reach 25,000 satoshi. Tips and trick to earn satoshi from coinminerz.com. TownBTC is a free game to earn BTC, to earn in TownBTC is very easy. After you register, you already have 1 bungalow. 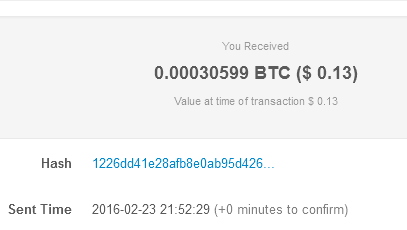 You will be collecting maximum BTC 0.00003/day. Do collect atleast 1 every 24 hour. You also can build another types of building such as Condominium, Ranch, Shop and Club. 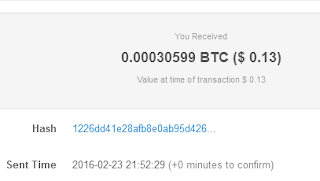 But because I need to know if they paying or not, I choose to withdraw just after I hit minimum payment which is BTC 0.00003 or 24 hours. The withdraw fee is 0%. At this time being, payment is frequently delay but paying. Unfortunately, this site seem to be a SCAM site now. This tool can be considered as old type device because the new technologies already much more advance than this one. I share this device because it's very easy to setup. Antminer S1 is a blade style miner, which contains two blade, assembled before Fab out. One blade can work separately. If you buy from Bitmain as manufacturer, you should prepare your own ATX Power Supply. 1. Read the IP address labeled in the Fan Bracket (Front). 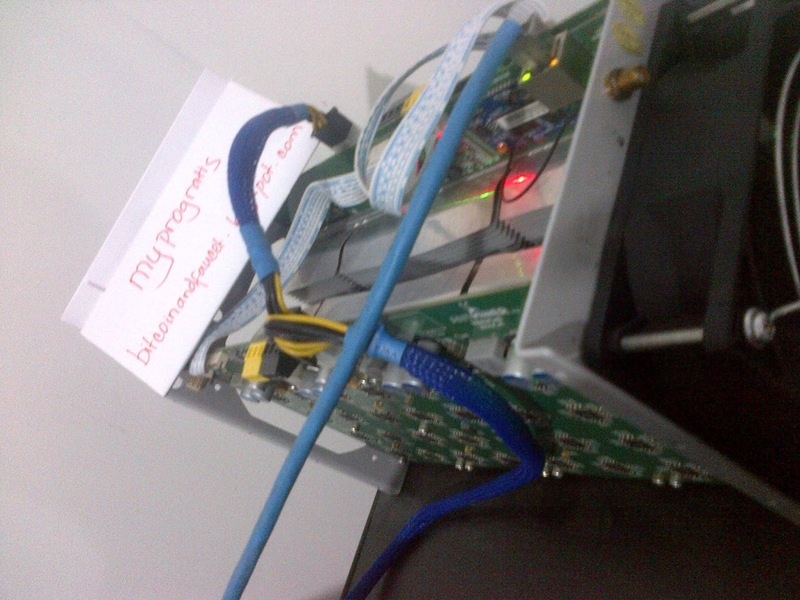 Manually setup your PC's IP address in the network segment same as the miner's IP address. 3. Enter miner's IP address into your browser then logon. Both username and password is "root" by default. 4. Setup Lan as DHCP client. 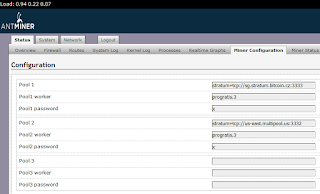 Click "Network -> interface -> LAN", select DHCP client. The default LAN value is 192.168.1.1 and WAN address can't be set as 192.168.1.x. 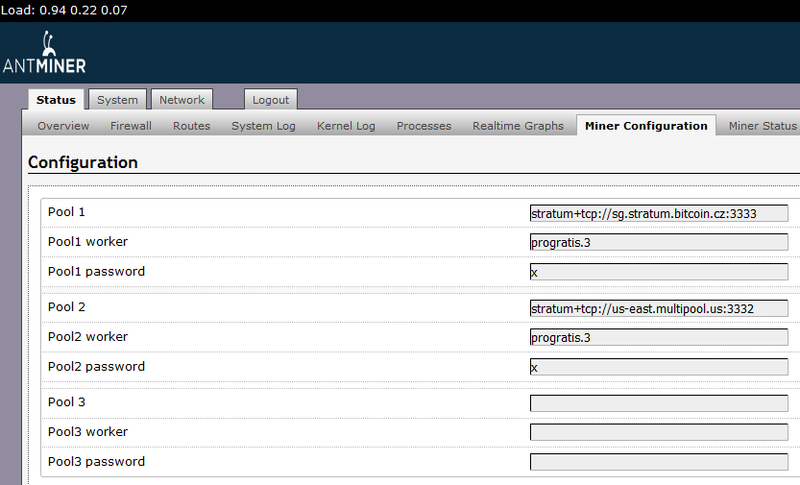 Pool Setting Pool can be set through "Status -> Miner Configuration". In the : Pool URL - enter the URL of your desired pool Worker - enter your worker ID in desired pool Password - enter your password for the pool and worker Antminer can set up three mine pools, the priority can decrese from first pool if the first pool encounter fault.